Virginia Foote, president of The International Center, signs a tripartite agreement between VVAF, GICHD, and the Standing Committee of the 504 Program on Mine Action during the visit of Ambassador Stephan Husy, Director of GICHD. Read more about VVAF's mine action programs here and more about Ambassador Husy's visit here. In 2016, a meeting to celebrate the National Day of Persons with Disabilities and sharing information on roles of assistive devices for people with disabilities was held in Quang Dien district, Thua Thien Hue. A VVAF staff member working on physical rehabilitation with a child at the Phu Ninh Center. In October 2015, IC-VVAF, along with the Department of State and our Vietnamese Government partners, conducted the Regional Senior Managers Training for ERW and Mine Action. The New Forests Project (NFP) is supporting water and sanitation projects in Honduras and El Salvador through the Clean Waters Initiative. This program provides technical assistance and trains instructors in rural communities to manage their water systems. The New Forests Project is aiding reforestation and agroforestry efforts in Haiti as part of the World Seed Program. New Forests is seeking to establish 15 new agroforestry and fruit tree nurseries, promote the planting of 15,000 agroforestry and fruit trees, organize training and workshops and increase the existing supply of tree seeds to Haiti. The New Forests Project (NFP) provides seeds, educational support and small grants for training and the purchase of reforestation equipment through the World Seed Program in Sub-Saharan Africa. The International Center currently has two programs working in South East Asia. Two of these programs, the U.S. Vietnam Trade Council Education Forum (USVTC-EF) and the Vietnam Veterans of American Foundation (VVAF) work in Vietnam. USVTC-EF works to build economic partnerships between the US and Vietnam. VVAF aids in landmine removal, conducts surveys on mental health disorders and helps in rebuilding schools. In addition, NFP provides small grants to organizations in Vietnam as part of their environmental support. Please note that VVAF is a project of The International Center. Please address all donations to The International Center. Please see these press clippings for the first MAPG meeting. April 2016: IC, SPD/MOLISA, and a technical group reviewed and provided comments on the questionnaires currently used by VNAH in 14 provinces. March 18, 2016: The Dai Dong Commune Health Station distributed mobility devices and, people with disabilities were trained on how to adjust and use the devices. A summary on the use of wheelchairs, crutches, walking frames and sticks was also delivered to each person. March 16, 2016: The MAPG was approved by the Prime Minister. IC-VVAF wishes all a happy Tet holiday! November 16, 2015: PACCOM recognized IC-VVAF as a foreign NGO that had made a significant contribution to the reduction of poverty and the increase in sustainable development. For full details, see the letter here. 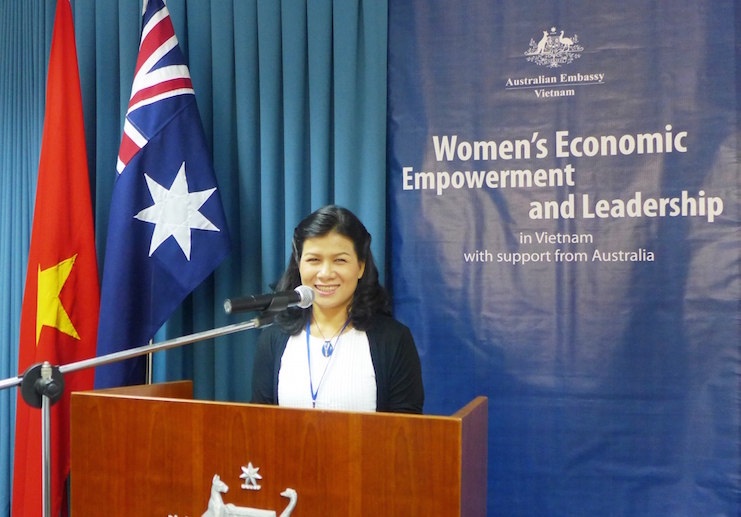 October 20, 2015: Thao Griffiths, President of IC-VVAF, spoke on the occasion of Vietnam's Women's Day (pictured below). Ms. Griffiths was also commended by the Australian ambassador. For full text of the letter from the embassy, please click here. IC-VVAF, along with the Department of State and our Vietnamese Government partners, conducted the Regional Senior Managers Training for ERW and Mine Action. The event drew mine action donors, as well as US and Vietnamese government officials and mine action professionals to engage the field on best practices associated with mine action in the region. Check out this article written about VVAF Co-Founder John Terzano for the University of Dayton. July 9, 2015: Vietnam Country Representative Thao Griffith was interviewed by BBC to provide comment on the US-VN relations on the occasion of the CPV General Secretary Nguyen Phu Trong’s visit to the US. Check out the video here. June 8-12, 2015: VVAF organized and facilitated a Leadership Training in Ninh Binh with representatives from 9 provinces of the Red River Delta. May 2-8, 2015: A group of American War Correspondents visited Vietnam as part of a delegation organized around the 40th anniversary of the Vietnam War's ending. The agenda for the trip is here. April 30, 2015: VVAF participated in Vietnamese activities celebrating the 40th anniversary of the end of Vietnam War. April 27, 2015: The United States Ambassador to Vietnam spoke at the VNMAC Groundbreaking Ceremony. A copy of his full remarks are available here. March 17-27, 2015: Two officials with the Mine Action Information Center at James Madison University visited IC-VVAF and relevant mine action stakeholders in Vietnam as part of their continuing work with IC-VVAF. Please see our newest Program Update! November 14, 2014: VVAF met with representatives from WRA, GICHD, and the US Embassy in Hanoi. They discussed IC-VVAF Program Updates, with a specific focus on Program 504 and the path forward. September 10-12, 2014: VVAF and GICHD conducted a milestone assessment workshop of the MORE Project in Hanoi. Please see the press clippings here. August 14, 2014: Dr. Hien participated in a workshop to promote for the Development and Quality Management of Training Curriculum and School Psychology Practice Facilities in Vietnam. The workshop connected American and Vietnam universities into a joint effort in psychology appliance. 29 representatives from 8 provinces participated in a Mental Health Leadership training. They were from a variety of different agencies including DOH, DOLISA, social protection centers for mental illness, and provincial mental health facilities. Lecturers and speakers included those from Melbourne University and representatives from NIMH, HSPH, DOLISA, WHO, and UNICEF. Dr. Hien (IC-VVAF) also delivered 3 sessions and facilitated group work during the course. The course covered topics on policy and legislation, mental health services, human resources, intersectoral collaboration and mental health information system. On the last day of the course, participants developed a work plan for province based on group discussion results each day. June 17-18, 2014: VVAF supported MOH in organizing and translating documents for the 1st Consultation Meeting for Mental Health Strategy. Participating in the conference were representatives of central and provincial agencies of health and social sectors including MOLISA, NPH#1, NPH#2, Hochiminh, Da Nang, Khanh Hoa, Thanh Hoa, Ba Ria Vung Tau, Phu Tho, Quang Ninh, Thai Nguyen, and Lai Chau hospitals and social protection centers. Prof. Harry and Dr. Ritz facilitated the discussion on the vision and principles of the strategy. Please check out or newest Program Update. June 7, 2014: VVAF attended the "Joining Hands to Share the Pain of Agent Orange/Dioxin Victims" event, which VVAF helped to sponsor. The event benefitted Agent Orange victims in Vietnam. For more information, click here. March 14, 2014: Please check out this information on the development partnership conference. January 21, 2014: Please check out these news articles about the Tam Kim School Opening. December 16, 2013: US and Vietnamese officials signed an MOU that strengthened their bilateral relations on mine action. This MOU is the product of 18 months of work which began with a study mission by the National Standing Board on Mine Action. This study mission was facillitated by VVAF as part of their technical assistance on mine action issues in Vietnam. Click here for pictures from the signing. October 14 - November 18, 2013: VVAF is taking part in the International Mental Health Leadership Program. The course will provide an overview of the challenges in international mental health reform and, in particular, will focus on the need to coordinate mental health policy, legislation, and financing. September 12, 2013: VVAF took part in “Mine/Explosive Remnants of War Victim Assistance: What role for information management systems?”. This session aims to provide several insights into the current range PWD tracking systems around the world, specifically relating to mine/explosive remnants of war (ERW) survivor/victim assistance, and information management. For more information, please click here. From June 3-6, 2013, VVAF and a delegation from BOMICEN/Engineering Command travelled to Laos. The delegation had a series of meetings with UXO Laos, as well as NRA and NPA Laos, to get an overall picture of demining operations, especially their on-going Pilot Land Release Project. The study tour to Laos aimed at researching how the Laos Regulatory Authority (NRA) accepted and endorsed Land Release methodology in Laos. For more information, please click here. From May 13-15, 2013, IC-VVAF facilitated a delegation from BOMICEN/Engineering Command to Quang Tri and Thua Thien Hue within the framework of Pilot Land Release Project. The fieldtrip aimed at exploring the land release activities currently conducted by NPA/Project RENEW in these provinces in order to withdraw experiences for the 2nd pilot project in Ha Tinh. For more information, please click here. IC-VVAF facilitated a strong Vietnamese government delegation in the 16th meeting of National Directors and UN Advisors and the Intersessional Meeting on CCM, which were held in Geneva from April 8-19, 2013. For more information, please click here. Ambassador Stephan Husy, Director of GICHD, visited Vietnam. During this visit, he signed a tripartite agreement between VVAF, GICHD, and the Standing Committee of the 504 Program on Mine Action. He also met with the Vice Minister of MOLISA and the Deputy Prime Minister of Vietnam, along with conducting roundtable discussions that involved Vietname government officials, embassies, the UN, and NGOs on Vietnam's Mine Action Day. GICHD has been a longtime partner of VVAF in its mine action efforts. Read more about Ambassador Husy's visit here, here, here, here, and here. Learn more about VVAF's work on mine action here. VVAF, along with the Boeing Foundation and the People's Committee of the Ba Dac District, organized an opening ceremony for the Tan Minh A Primary School on January 28, 2013. The new school building has six spacious new classrooms. On January 2, 2013, Thao Griffiths and Thu Ha accompanied 10 Vietnam military officers to an Underwater UXO/EOD exchange in Guam (USA). The exchange was hosted by the US Navy Mobile Dive Unit 5. On November 18, VVAF and a group of 3 MoD officers attended the Regional Mine Action Contracting Workshop in Siem Reap, Cambodia. The workshop was co-organized by GICHD and CMAC. Attending the workshop were 39 participants from various mine action organizations across the region, including WRA, DDG, NPA, UNDP, UNMAS, APOPO, MAG, UXO Lao, and TMAC. Apart from the 3 MoD officers, there were also 2 participants from Quang Tri Provincial Department of Foreign Affairs. Read more about VVAF's capacity building programs in mine action here. Major General Walter D. Givhan, Deputy Assistant Secretary for Plans, Programs and Operations in the U.S. Department of State’s Bureau of Political-Military Affairs paid a visit to Vietnam from May 2-3, 2012. He joined a working lunch with officials from relevant government agencies in charge of mine action and visited the land release field site. Click here for more information on VVAF's mine action programs. On December 5, as part of the Landmine Program, VVAF held the Mine Action Donor Roundtable Meeting in Hanoi. Important guests included Prime Minister Nguyen Tan Dung; Vice President Mdm Doan; Chairwoman Mdm Ngan, from the National Committee's Committee of Budget, Committee of Foreign Affairs; as well as several ministers and vice ministers of relevant Vietnamese government agencies. Click here for the invitation, click here for the press release, click here for news about the event, and click here for pictures of the event. As part of the Landmine Program, VVAF, along with BOMICEN, organized the “Technology in Mine Action Workshop” on November 24-25 among regional countries, NGOs, and international manufacturers in the field of mine action. Click here for the letter regarding the workshop and click here for information on the workshop. As part of the Mental Health Program, VVAF received a delegation from the Centre for International Mental Health at the Melbourne School of Population Health on November 14-20. The delegation participated in workshops and other activities with the goal of improving mutual understanding. As part of the Landmine Program, VVAF took part in Landmine Working Group meeting on 14th October 2011. Attending the meeting were 18 participants from Vietnam government agencies, embassies, INGOs, and other relevant stakeholders. At the meeting, participants shared their updates on mine/ERW projects in Vietnam and discussed the possibility of Vietnam joining the Convention on Cluster Munitions (CCM). Click here for a list of participants. From September 3 to October 2, as part of the Mental Health program, Country Representative Thao Griffiths and Dr. Nguyen Thi Mai Hien attended the International Mental Health Leadership Program in Melbourne University. The focus of this one-month training program was the mental health system development in Vietnam and Sri Lanka. On September 28-29, Senior Mine Action Managers in Vietnam took part in a two day training prepared by VVAF. Click here to see a report on the training. Click here to see the agenda of the training. Click here to see the list of participants. On September 18-21, BOMICEN/VBMAC, with support from VVAF, participated in the land release workshop held in Cambodia. Click here for a report on the workshop. Click here for the agenda of the workshop. On September 12-16, Vietnam, with support from VVAF, sent an official delegation to the Convention on Cluster Munitions in Beirut, Lebanon. Click here to see a report of the convention. Click here to see a report of the side meetings held by the Vietnamese delegation. As part of VVAF's Rehabilitation projects, Country Representative Thao Griffiths attended the second international conference on Agent Orange/Dioxin, which was held August 8-9, the 50th anniversary of first use of Agent Orange in Vietnam. As part of VVAF's Rehabilitation projects, a group of Vietnamese-American Fellows came to Vietnam to work in six week fellowships with organizations that help the disabled. VVAF, as part of its Mental Health program, hosted Ross Anthony, Global Health Director of RAND, from July 31-August 3 at its offices in Vietnam. As part of the visit, a number of meetings were held with Vietnamese counterparts and stakeholders in mental health. Click here to see the latest program update for VVAF. Please click here for our newest update: VVAF Update December 2010.pdf. VVAF Elected to attend the Vietnam Consultative Group Meeting.